IOC member and former Canadian Olympian Beckie Scott says what Russia did is unlike anything seen before. That's why she wants a blanket ban on the Russian squad at the Rio Games. The Russian sports doping scandal keeps on growing. After months of investigation, a report by sports law expert Richard McLaren has confirmed some of the worst allegations against the Russian Olympic Committee. The report confirms Russia's doping was state-sponsored. And it says there was indeed a lab in Moscow that made deliberate attempts to ensure doping attempts were covered up. Now the attention is shifting to the question of what the International Olympic Committee will do next. And wether the IOC has the power to remove all Russian athletes from the upcoming Rio Games. Beckie Scott is a former Canadian gold-medal cross-country skier. She was directly affected by doping by Russian athletes at the 2002 Winter Olympic Games in Salt Lake City. There she came in third and won a bronze medal in the five-kilometre pursuit. She was later vindicated with a gold, once it was discovered the two Russians that originally came in first and second place were disqualified for using performance-enhancing drugs. Scott is also an IOC member and she sits on the World Anti-Doping Agency's athlete committee, or WADA. Here is part of her conversation with As It Happens guest-host Helen Mann. HELEN MANN: Were you surprised by the findings in the report from Richard McLaren? BECKIE SCOTT: We were surprised by the extent of the involvement of the (Russian) Ministry of Sport. That was definitely a surprise. I don't think anyone really truly believed there was an entire system in place overseen by the government. I mean that was just really shocking, really astounding. And as our WADA athlete's committee met after the findings of the report were released, the sentiment among everybody was a deep and profound sadness ... there can only be one response - and that is to remove the Russian National Olympic Committee from the Rio Games. HM: Had you wondered for a long time how they were doing this? BS: Yes. I guess I had. I mean it was fascinating on one level to read about the measures and the actions that were going on in order to completely subvert the anti-doping system. You know it made me wonder if this was going on even when I was skiing and racing ... and most likely it was. 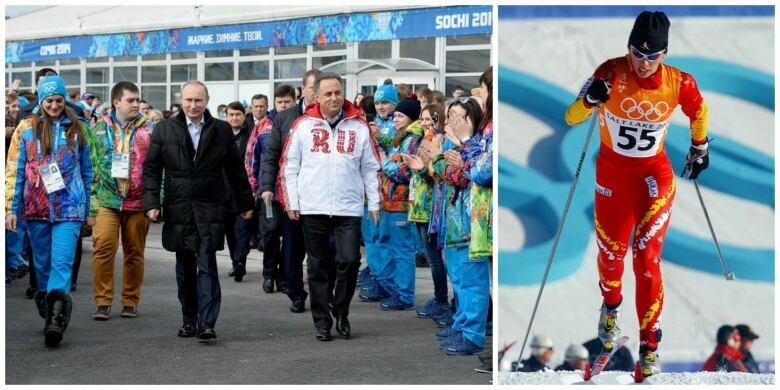 HM: You suspected at the time that the two Russian skiers that were ahead of you, were doping. What kind of effect did that have on you as an athlete? BS: It was incredibly frustrating and disappointing to know that you're lining-up at the start line against athletes who have an inherent advantage. And there's nothing you can do about it. You can try your best. You can train for years and years. And do everything possible within your power but the fact is you will be at a disadvantage because you're not using performance-enhancing drugs. HM: Do yo think that action on this kind of thing, like the banning of the Russian team for example, could improve the public's view of sport? BS: I do. I truly believe we are at a crucial and watershed moment. If we don't get this right and if we don't take the kind of measures and actions that are necessary .. then we stand to lose a lot. I'm very sensitive to the fact that we are on the verge of losing, not only the public's faith in sport, but athletes belief and confidence in the system they are a part of. And if we lose that, we lose everything.